When the "Auto-name Files" option is enabled, you can add the document title to the file name by checking the "Include Document Title" option. The document title is set by the calling application, and may change for each document being printed depending on the application. 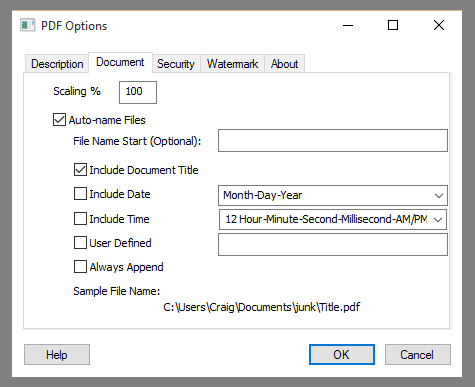 The "Sample File Name" listed at the bottom of the window is updated to show the resulting file name based on the options selected using "Title" as a placeholder for the application document title. This option can be combined with any of the other auto-name options.